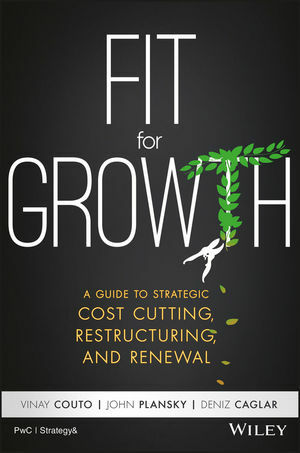 Fit for Growth* is a unique approach to business transformation that explicitly connects growth strategy with cost management and organization restructuring. Drawing on 70-plus years of strategy consulting experience and in-depth research, the experts at PwC’s Strategy& lay out a winning framework that helps CEOs and senior executives transform their organizations for sustainable, profitable growth. This approach gives structure to strategy while promoting lasting change. Examples from Strategy&’s hundreds of clients illustrate successful transformation on the ground, and illuminate how senior and middle managers are able to take ownership and even thrive during difficult periods of transition. Throughout the Fit for Growth process, the focus is on maintaining consistent high-value performance while enabling fundamental change. VINAY COUTO is a principal with PwC US. JOHN PLANSKY is an executive at State Street. DENIZ CAGLAR is a principal with PwC US. The authors bring more than 70 years of combined strategy and business transformation consulting experience and the unrivaled industry and functional capabilities of the PwC network to solve companies' toughest problems and help them capture their greatest opportunities. Strategy& is PwC's strategy consulting business.